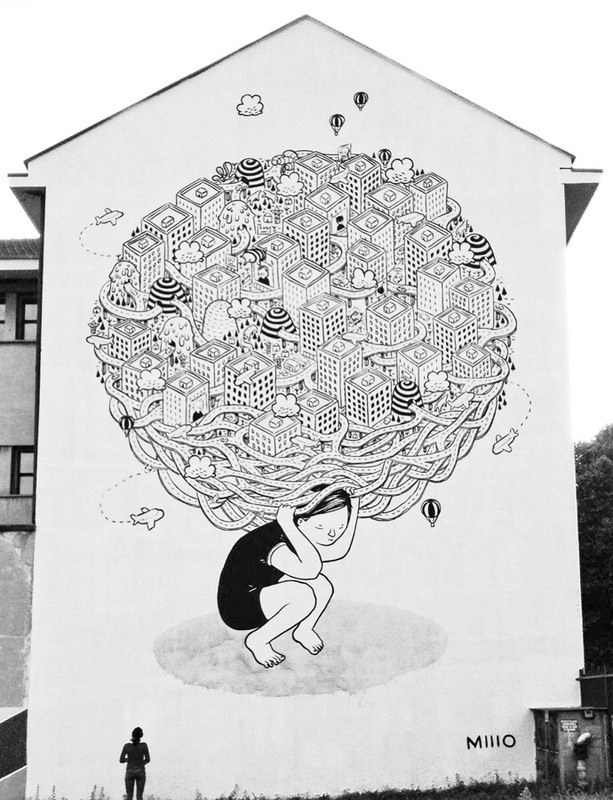 I came across the work of Millo on Instagram and automatically loved his eye for detail and sense of humor (and whimsy). 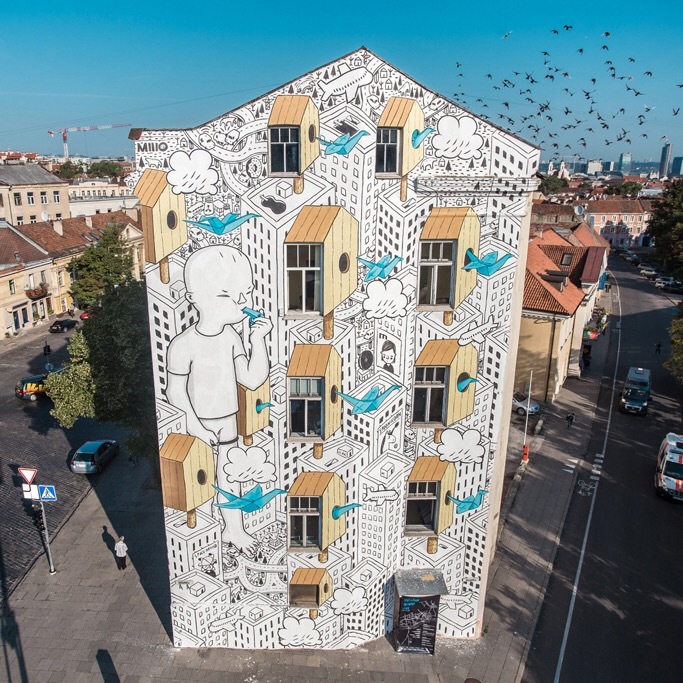 His large murals remind me of giant coloring book pages or vignettes from children’s books. But each scene is trademark Millo, each story endearing and sometimes mysterious. If you look closely you can find lots of fun details (can you spot the batman Millo in this post?). The Italian artist has created work everywhere from Holland to Rome. He was kind enough to answer some questions via email. Check them out below! 1. How did you first get involved in public art? I started in 2010 in Italy for the first time. I decided to follow my passion (I have always drawn since I was a child). I took part in a big event about street, video art, in Ancona… before that I used to paint on canvases. 2. Your pieces are very whimsical, playful and detailed. Do you plan visuals ahead of time or is your process spontaneous? Even if it should appear strange, I usually go to a lot of festivals without a clear idea of what to realize, only after I have spent in the city some hours,my imagination starts to work. In any case, I only choose what the characters should do, all the rest is completely spontaneous and free hand. 3. What sorts of materials do you use when you work? I only use acrylic paint, brushed and a good boom lift! 4. Are your characters inspired by anyone? My characters are always inspired by someone or something. I used to reproduce things I live or things I feel… sometimes it could be a real person but most of the time it’s a question of emotions. 5. Is there somewhere in the world you would love to paint that you haven’t already visited? I really would like to paint in Rio even if I’ve been there… But those were holidays! 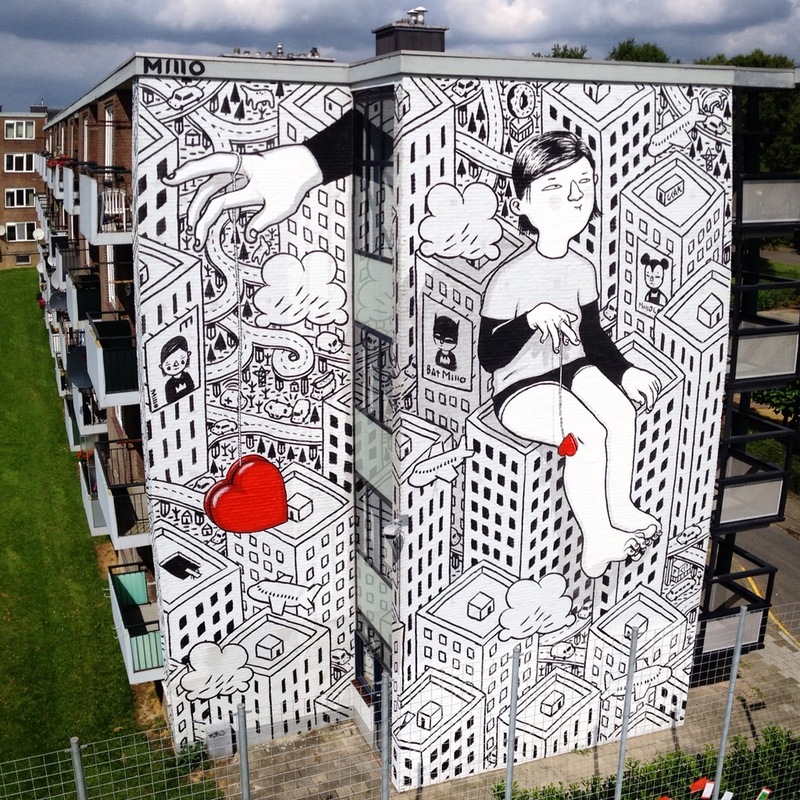 This entry was posted in interviews and tagged art, Millo, painting, public art, street art. Bookmark the permalink. Isn’t it fantastic? Glad you enjoyed the post.